New Year’s Resolution, 2015: Cut the cord. I know I’m late to the party by some accounts. Early adopters cut the cord years ago and haven’t looked back. For me, turning off cable TV was an idea I flirted with, yet I just kept renewing my package deal for some reason. But there has been no better time to finally sever ties with big cable, and their pricey television packages that have you paying for hundreds of channels when you only watch a handful of shows – many of which you’re probably already streaming on Netflix or Amazon. I know there are people out there weighing the decision, too. So here’s my entirely subjective, totally personal take on what it’s been like to cut the cord in 2015: my personal diary of being a newbie cord cutter this year. The focus of this diary is largely on television, with less emphasis on sports and movies, though they are addressed. Everyone has their own reasons for cutting the cord, but my decision was both financial in nature, as well as based in common sense. I spend more time online than sitting around mindlessly watching television, outside of a few favorite shows. And there’s so much quality TV content being produced these days that I have a massive selection of new shows to choose from after I binge watch my way through one series and need to move on to something new. * In this diary I will reference actual TV shows I watch. You are free to trash me in the comments for my lack of taste. Thanks. Before cord-cutting, Verizon was my TV provider. My Verizon package deal, however, had ballooned to $189 for phone, TV and internet combined after my introductory offer period had ended. That’s a lot of money, especially when I mostly use the internet for entertainment and rarely spend evenings vegging out in front the TV hunting for something to watch. I was moving, so I had to cancel my service anyway. It seemed like an ideal time to make good on my resolution. It worked. I was free! Today, for the price of $65 per month, I have FiOS internet. I also pay $99 per year for Amazon Prime (which I use for more than Prime Instant Video, of course). And I pay for $8.37 per month for Netflix and $7.99 per month for Hulu Plus. For the three services combined (Amazon, Netflix, Hulu), that’s $24.61 per month for “TV” and, frankly, that’s just about right for the amount of shows and movies I watch. All the services I pay for are available online and on mobile devices. But there are times you’ll still want to sit in front the big screen. I know I do. You’ll need a set-top box or streaming stick, then. Here, personal preference comes into play quite a bit. For those invested in the Apple ecosystem, an Apple TV might make more sense, especially if you have an established library from iTunes. For those who prefer Google’s services, there’s the newer Android TV. And for Amazon subscribers, who may have a few “season passes” there or other acquired content, the Amazon Fire TV and Fire TV stick are also decent choices. 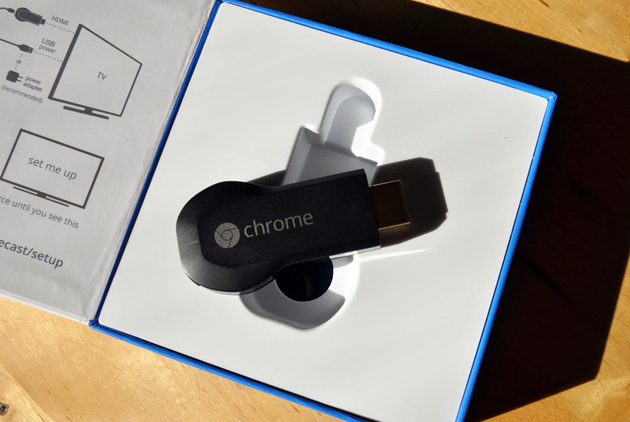 A cheaper option is Google’s Chromecast stick – and apparently, people like cheap. 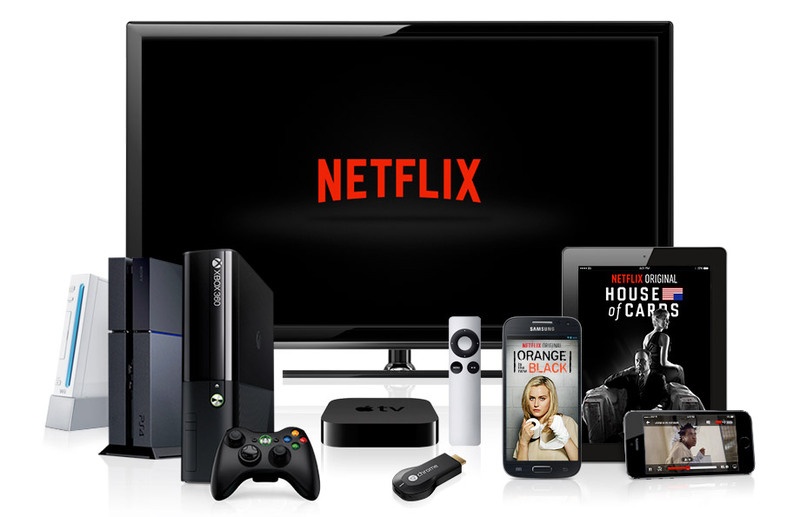 The stick was the top streaming device in the U.S. in 2014, Google is now claiming. Some of these products are pricier than others, and they each have their advantages and disadvantages in terms of feature set, apps, and supported services. There’s no need to reinvent the wheel here, so let me just link out to a handy, blow-by-blow comparison chart if you’re undecided. If the only thing you care about is price, Amazon’s stick or Chromecast will do, but they both can be frustrating at times. Investing in a product that has a remote (or can work with one, like Amazon’s stick), makes for a smoother transition. I like the Roku 3’s remote control. I like that I can plug headphones into the remote and not wake the kid when watching loud movies late at night. But mostly, I found that I liked Roku 3 best for its overall ease of use, content offerings, and feature set. There are other technical reasons to buy the Roku 3 over Roku’s other products, like all the ports or the speed increases it offers. 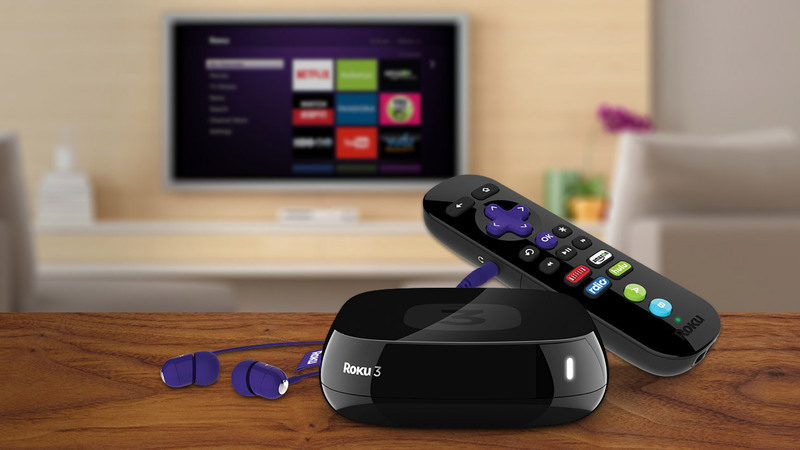 If you really can’t swing the cost, the Roku 2 will get you by. But the truly great thing about Roku is that it’s not biased towards its own content. Amazon, Apple and Google each offer their own TV and movie ecosystems, so they’re promoting those with their devices, sometimes at the exclusion of others. Roku is agnostic. I can watch Netflix and Amazon and Hulu all from the same device. When I borrow an HBO GO password, it’s right there, too. In fact, Roku offers 2,000+ channels, so you’re never really hurting for content. You can watch news, play music, check out YouTube videos, and even access niche and indie fare. There are free channels like PBS, Crackle and Smithsonian, plus for-pay add-ons for sports including soccer, NHL, NBA and more. With Google’s products, on the other hand, it’s been frustrating because I couldn’t easily stream the Amazon movies I had previously purchased without, say, Chromecasting a tab from my computer. I put my Chromecast in my daughter’s playroom, and it’s been a nightmare. Every few minutes, she wanted to grab my phone to change her chosen Netflix program. “I wanna watch something else!,” she says, snatching the iPhone from my hands. And the number of times I’ve had to walk to the office computer to Chromecast our copy of Frozen or Tinker Bell from Amazon.com in these early days, I can’t even tell you. Too many. The Android TV, like Amazon Fire TV, offers a voice search option. This is reportedly a selling point for the service. I don’t use it much. I feel strange talking to my TV. It’s been years, and I’m still trying to make friends with Siri. Give me some more time, I guess. I leave the Android TV logged into Netflix these days as a workaround to the fact that I don’t want it showing my daughter my “recommendations.” Then I just power off the TV. I might upgrade this room to a Roku too, I think. While I’ve checked out a variety of set-top boxes, I found that I personally prefer the Roku for a number of reasons. Streaming from the Roku is simple, and requires only a few button presses on the remote to get to your content. And if you like to “cast” your shows from your phone, that’s an option, too, with apps like Netflix and YouTube. Roku also offers its own smartphone app, but I’ll admit I never use it. The user interface for navigating the Roku is best, in my opinion, as it’s easy to drill down into selections like “Music” or “Sports” or “News” when you’re looking for something specific. And the Roku’s “Channel Store” lets you customize your device to show you just your favorite apps (e.g. Netflix, Hulu) on its main screen. But no matter which device you end up using, the most jarring thing about switching to streaming content over traditional TV, initially, is that each app’s (service’s) user interface is so different. The way you search, surface recommendations, access saved or favorited shows, turn on or off closed captions, etc. is unique for each one. You have to learn a new set of behaviors as you move in between apps – something that wasn’t an issue with traditional cable TV. That can be problematic for less technical users, but it’s not an insurmountable challenge. After you reach a certain comfort level with the intricacies of using the software and apps themselves, that’s when the reality of your disconnected, cord-cut state finally kicks in. Week 2: OH GOD, WHAT HAVE I DONE? NO LIVE EVENTS! I HAVE TO WAIT TO WATCH THAT SHOW? WHAT? The next episode of that show you’re watching week-to-week that left you on a cliffhanger? The one where you’ve literally been counting the hours until its resolution in the next episode? You’ll have to wait at least another day, even when you subscribe to a Season Pass on Amazon or have it favorited on Hulu. And that’s torture. Note: I found there’s a workaround for this particular problem involving sites that aren’t legal and that I’m not linking to, for fear of them being shut down. There’s one in particular that has rescued me repeatedly and even gave me “DVR space” in the cloud. God bless you, seriously. For many, the sports problem is severe. I don’t personally care about this, but you probably will. That’s really a whole other post, though. I cannot begin to detail the hoops you have to jump through to watch live sports through less-than-legal means. But at least you have the Super Bowl, right? And may I suggest you make a friend who pays for cable? Or you go to a bar? Or get that Sling TV for some ESPN? Sling TV’s service, in case you missed its recent launch, can ease your cord-cutting pain, not only for sports, but also if there are specifics channels you want to access without a cable subscription, like TBS, TNT or Disney and Disney Jr., all for $20-$25/month, depending on your selections. I don’t see the point of doubling my “TV” bill for these extraneous channels, however, especially since I don’t need the sports coverage. The other funny thing about being a cord-cutter is what you realize you can live without. While I was sad to miss some of the live events, I don’t miss my local news, and a good handful of shows that just became too hard to reach. News, after all, is online and on social media. And for every “just okay” show you have to drop, there are plenty more better ones to take its place. For those absolute must-have’s that are too expensive…well, there are…uh, ways. For example, CBS has this funny notion that its shows are so good they deserve their own standalone, subscription service. Um, no. CBS is making five episodes of its shows available for free on its website, and for subscribers, the most recent seven episodes from top shows. Not the full season. And you have to watch ads. The larger point is that I’m fine with dropping some shows that I was only marginally committed to. And it’s not likely that I’d pick up new ones from CBS unless they somehow produced a knockout hit of the Games of Thrones variety. Which they can’t. Because they’re network TV. In other words, CBS’ greed here could be its downfall. They made their content harder to watch by paywalling it, as services like Netflix, Amazon and Hulu are producing dozens of original series, many of high quality. Award winners, even. Life without 2 Broke Girls exists, and it’s just fine. That show is bad anyway. Goodbye, CBS. Around a month into cord cutting, you begin to get used to the drawbacks of the new lifestyle and find that when you’re forced back into old patterns, they grate on your nerves even more before. Hulu, for example, becomes exhausting. The user interface is fine, the content is plentiful, and you need it in the mix if you’re watching network TV programming – which, as a newbie to cord cutting, you’re probably not entirely ready to give up. But the commercials! I mean, it’s just like watching TV! Or worse! That can be a rough transition after binge watching your way through Orange is the New Black on Netflix. Not only does Netflix not interrupt you with ads, it even helpfully plays the next episode for you. Still binge-watching?, it occasionally stops and asks. Yep, go on. On Hulu, you can’t avoid the ads and they’re even more frustrating than when you had cable TV because you can’t skip them and you often have to watch the same ad over and over at numerous commercial breaks. The limited access to content on Hulu is annoying, too. If you’re keeping up with a “current” show, it’s fine. But god forbid you’re trying to transition from Season 1 on Netflix to the new Season 2 episodes on Hulu. You often can’t do so seamlessly. That’s because Hulu only maintains a handful of the “most recent” episodes. This is the dumbest, worst thing ever. This sort of transition between services to access different seasons of the same show is not user-friendly. It would be so nice to watch everything available from a show in one place, but often, you cannot. Thanks to this experience, I’m now learning another cord-cutting trick: don’t bother picking up new shows that are still on the air. Wait until a service scores them as a whole entity. And waiting week-to-week for new content is pretty much officially the worst. I much prefer the Netflix release schedule: they dump an entire season at a time. Who cares when people watch anyway? Shouldn’t it just matter that they do? While I’m going to see my commitment of “currently airing” shows through (e.g. Modern Family, Parenthood), when it comes time to fill the void, I’m looking for shows with many seasons under wraps already, those that release full seasons at a time, or those that have already ended, but that I never watched. I’ve already slipped up, though. Because I don’t always pay close attention to what’s actually “on” TV these days, I found myself streaming The Fall on Netflix. But as I was working my way through Season 1, I read online that Season 2 was only then coming to the service later that month. Whew!, I thought. I guess I lucky – it didn’t even occur to me that I may have picked up a new series where the second season wasn’t going to be streamable. Week Five: Getting Bored. Recommend Me Something, Please. With cord-cutting, the bigger challenge now is finding good shows that you actually want to watch. TV is not this passive thing you turn on and click around on. It’s become a thing I do with more purpose now. I turn it on to watch a specific show, movie, or special. I know what I’m going to watch in advance, usually, or have a good idea what’s waiting for me in my Hulu queue. But now that I’m not filling my down minutes with random home makeover shows from HGTV, I find that I’m always looking for the next thing to binge. The Sopranos wasn’t really my kind of thing, anyway, having a preference for family-friendly comedies I can watch around the kid, plus sci-fi, mystery and adventure. I know I don’t care for extreme horror or lots of gore, which helps me avoid some arguably the better shows on TV (The Walking Dead, American Horror Story), which would be, for me, the worst. These days, picking up new shows can be totally hit-or-miss. Netflix, by far, has the best recommendations, but even theirs are often off the mark thanks to years of account sharing before the new profiles kicked in. I do, however, appreciate their Facebook integration and the recommendation prompts, so I can at least spot trends and get suggestions from friends. But still, I find that often my friends are, like me, just working their way through the classics. They’re re-watching Friends, streaming old movies, or they’re watching documentaries and comedy specials. And we definitely don’t always like the same things. Outside of some of my favorites like Battlestar Galactica or X-Files (one of which is due for another run-through by next year, I think…wait, do these stream? ), I’m not going to re-watch anything. I want new things. I come across recommendations haphazardly these days. A friend mentions they’re watching something, and I hit up each service to see where it exits for online streaming, or if it even does. I heard, for instance, that the lady who played Cuddy on House had a new show about being a divorced (and, apparently, crazy rich) mom. Girlfriends Guide…um, something. I read a tweet that said it was okay, but then forgot about it for weeks. Randomly, I decided to check it out. I looked around. It’s on Bravo? Where the heck does one find Bravo shows? Isn’t that the Desperate Housewives channel? It simply wasn’t available for free streaming on the big three services without a cable subscription. Of course, Amazon was offering to sell it to me. They’re handy like that. But I didn’t even know if I’d like it, much less want to commit to paying. So I stole it. (And you know what? It was only okay. I’m glad I saved my money.) In the long run, it was more hassle than it was worth to check out a new, not immediately streamable show. Again, I had to remind myself of my personal rule for cord-cutting: Stop watching current TV. Week 6: Oh Right, Movies! You Still Watch Those? Yes, I know I haven’t mentioned movies. There’s a reason for that. They’re mostly really awful lately. Did you see The Interview? Unwatchable. Horrible Bosses 2? The worst. The Hangover 3? Sad. It’s cliché to complain about this: Do movie studios have any new ideas? Wasn’t the book almost always better, anyway? There are only so many new movies I’m going to stream these days, and when they become available, it’s probably worth it to just rent them online or grab a Redbox if they’re really a must. The older classics that are actually worth another viewing are plentiful enough on the streaming competitors, and if your favorite is not, it’s probably for sale somewhere online instead. There are just tons of ways to pay for movies, but Amazon, Google or Apple make the most sense, depending on which ecosystem you prefer. Roku also has other apps where you can pay for movies, and you don’t have to think about what those are – it shows you when you do a search what options are available for accessing the given film, and how much it costs on each. And if you’re too cheap to pay? Well, you know how that works. The occasional movie purchase isn’t a big impact to the “TV” budget’s bottom line, because you probably don’t see movies in the theater as much as you used to. After all, outside of “event” movies like the new Star Wars, trendy trilogies like The Hunger Games, or those meant for big screen viewing, like Interstellar, you don’t need to go to the theater much these days. Breaking Bad. Sons of Anarchy. Homeland. True Detective. Mad Men. Orphan Black. Orange Is The New Black. Louie. Game of Thrones. House Of Cards. Downton Abbey. Boardwalk Empire. Girls. Arrested Development. Transparent. I’ve barely watched half of these, so I have content ready for months to come. This is only month one – or technically, one and half since I actually moved in December and cut the cord then. I doubt I’m ever going back to cable TV. Ever. For the price and the content, the mix of the three services (Amazon, Netflix, Hulu) are all I need for now. And I hope that in a few years’ time, Amazon and Netflix will have beefed up their original content to the point that I no longer have to lean on Hulu for more TV. I know I’m eventually going to buy a subscription to HBO GO, so I’m sort of dreading my “TV” bill’s price increase for that. But I also know that HBO has a lot to offer in terms of quality TV, and that’s what I need more of. By the end of the year, my personal cord-cutting experience may look entirely different. And that is, I think, a good thing. * This diary may be updated later in the year.